Lily has grown up believing she accidentally killed her mother when she was four. She not only has her own memory of holding the gun, but her father’s account of the event. Now fourteen, she yearns for her mother, and for forgiveness. Living on a peach farm in South Carolina with her father, she has only one friend: Rosaleen, a black servant whose sharp exterior hides a tender heart. South Carolina in the sixties is a place where segregation is still considered a cause worth fighting for. When racial tension explodes one summer afternoon, and Rosaleen is arrested and beaten, Lily is compelled to act. Fugitives from justice and from Lily’s harsh and unyielding father, they follow a trail left by the woman who died ten years before. 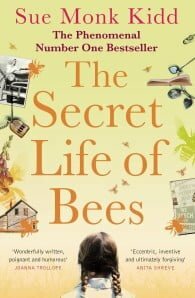 Finding sanctuary in the home of three beekeeping sisters, Lily starts a journey as much about her understanding of the world, as about the mystery surrounding her mother. Sue Monk Kidd is the author of the highly acclaimed bestsellers The Secret Life of Bees and The Mermaid Chair. Selling over 8 million copies, The Secret Life of Bees was her first novel, and has become a modern classic. It has been adapted into a feature film starring Queen Latifah, Dakota Fanning and Jennifer Hudson.